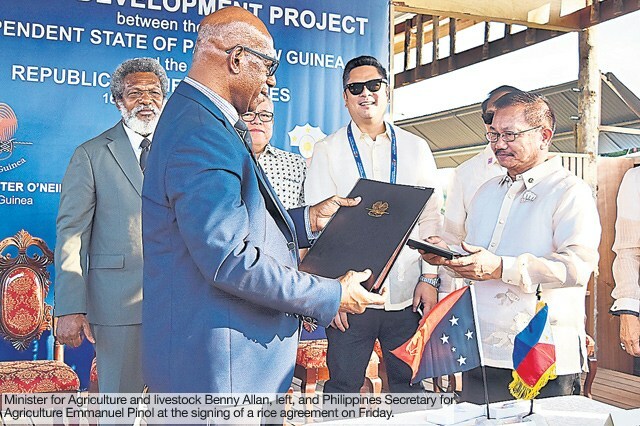 In the lead-up to last year’s APEC meeting, PNG and Filipino officials met beside rice paddies on the outskirts of Port Moresby to sign an unprecedented agreement. The recently signed five-year memorandum of agreement (MoA) calls for cooperation between the two governments in a range of agricultural sectors, including coconut, cocoa, coffee and palm oil. However, rice is key to understanding this deal. Philippines Agricultural Secretary Manny Piñol and PNG’s Agriculture and Livestock Minister Benny Allen signed the deal at a 25-hectare pilot rice farm next to Pacific Adventist University. The pilot kicked off in August last year, with help from 19 Filipino rice experts (handpicked from Piñol’s electorate), as well as supplies and equipment imported from the Philippines. On the day of the signing, on a podium overlooking the pilot site, both Piñol and Allen spoke glowingly about the arrangement. Piñol said the productivity from the pilot had far exceeded expectations. He forecast that the next phase of the project would result in 4-5 megatonnes (4-5 million metric tonnes) of rice production in PNG within 2 years. That is an extraordinary prediction. It represents an increase of 5-600 times over PNG’s current production: PNG currently produces less than two per cent of the 400,000 tonnes of rice it consumes each year. To realise this level of production, Filipino experts will help develop a larger rice plantation in East Sepik province. PNG’s Department of Agriculture is planning to leave an initial 100,000 hectares to Filipino companies, which both governments want to increase to one million hectares in five years if successful. The small rice farm on the outskirts of PNG’s capital has become Piñol and Allen’s ‘field of dreams’. On the PNG side, the agreement provides the promise of self-sufficiency, a key goal of the PNG Rice Policy 2015-2030. As the National Research Institute’s Ron Sofe and Francis Odhuno have outlined [PDF], for decades successive PNG governments have tried to get traditional landowners to give up land for large-scale rice production, with little to show for their efforts. The PNG government is hoping that Filipino expertise and optimism will work where others have failed. The deal also promises to turn PNG into a rice-exporter, in turn bringing in much needed foreign exchange. While touted as an example of South-South philanthropy, the Philippines expects much out of this deal. For a start, it hopes to import rice in excess of PNG’s own needs, in turn securing its own rice supply. While the Philippines produces 93 per cent of its requirements, rice security is a long held and deeply political policy goal. Secretary Piñol has promoted the PNG deal as a way of mitigating reliance upon traditional exporters – India, Vietnam, Thailand, and increasingly Burma – who at times struggle to feed their own populations and can cease exporting rice if in their interests (as was the case during the 2007-8 food crisis). Piñol believes PNG can produce rice as cheap, if not cheaper, than these exporters. However, the Philippines wants far more out of this deal than rice. While promoting the agreement, Piñol has also railed against PNG’s moves to increase charges for fishing vessels that access the country’s waters. He has called the proposal “unfair” for Filipino fishing companies. In addition, PNG Prime Minister Peter O’Neill wants all fish caught in PNG waters processed within the country, which threatens Philippines’ tuna processing industry. The MoA could help smooth the way for Filipino companies that work in PNG and its waters. Many Filipinos are sceptical about the agreement. Late last year, Trinidad Santiago, a member of the National Movement for Food Sovereignty, said “Why should we patronise the products of another country when the government could support small, local farmers – they could feed the country.” Prominent politicians have also called for more resources for Filipino, not PNG, farmers. Some economists have argued the country would be better off importing more rice from existing trading partners. This debate is heating up, as rice prices significantly increased in 2018, and parliament is debating a bill to uncap rice imports and introduce tariffs. In PNG, however, there has been little public discussion about the implications of the agreement. This is concerning given the failure of recent agricultural schemes and the challenges associated with communal land ownership. The Filipino private sector is set to lead implementation of rice production, with Piñol promising landowners a 20 per cent share. In PNG, such arrangements are notoriously difficult to manage. For example, PNG’s Special Agricultural Business Lease scheme (which started around 2004) promised a legal mechanism to allow landowners to lease their land to foreign companies, who would in turn develop agricultural projects. Assessments of this scheme show it has led to corruption, environmental destruction, dispossession and human rights abuses. Recently, the UN Committee on the Elimination of Racial Discrimination suggested the scheme might have infringed on indigenous peoples’ rights under the International convention on the elimination of all forms of racial discrimination [PDF]. The sheer scale of the proposed rice project – up to one million hectares, or two per cent of PNG’s land territory – means that those involved will need to negotiate with numerous landowning groups. Even with the best of intentions, keeping landowners onside is not easy – just ask any PNG-based mining company. In turn, this agreement needs greater, and ongoing, scrutiny. While seeking to improve the food security of both countries is laudable, PNG’s poor governance and communal land tenure systems could turn Piñol and Allen’s ‘field of dreams’ into fields of nightmares. 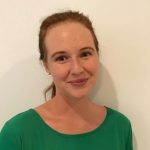 Elena Ryan is a student at ANU’s College of Arts & Social Sciences. Imelda Deinla is a Fellow in the School of Regulation and Global Governance (RegNet) and Director of the Philippines Project. Rice is the most controversial agricultural crop in PNG. Rice imports have been in the range 120 000–208 000 tonnes per year between 1990 and 2005, mostly from Australia (see Section 2.7). In contrast, domestic rice production has been in the range 60–2200 tonnes over the period 1962 to 2000 (Figure 2.5.1, Table A2.5.1), and has averaged about 400 tonnes per year since 1980. This is around 0.25% of rice consumed per year in PNG in recent years. Claims are made for significant local production from time to time, but these are political statements rather than realistic estimates. Production in 2006 was estimated as 300–800 tonnes. PNG leaders accuse the former Australian colonial administration of discouraging domestic rice production in PNG in order to protect an important export industry in Australia. Since Independence in 1975, plans for a domestic, import-replacement rice industry have been a feature of every government white paper on agriculture. Yet, since 1977, domestic rice production has never exceeded 1% of the amount of rice imported. Rice has been grown in many parts of PNG. Before 1900, rice was grown, mainly by Catholic missionaries, in the Bereina area and on Yule Island in Central Province, at Aitape in Sandaun Province, and probably at other places. In inland Finschhafen in the Sarawaget Mountains of Morobe Province, Lutheran missionaries introduced rice growing in the early 1900s and it is today the only place in PNG where it has become a ‘traditional’ crop. After 1918, rice growing in Papua (the Southern Region) was a compulsory village activity under the Native Plantation Ordinance (1918). The Papuan colonial administration sent an officer to India, brought Indian instructors to Papua and established a ‘fully equipped rice mill’ in an attempt to ‘make the Territory self-supporting in rice’. For example, the colonial administration promoted village rice cultivation in the Cape Vogel area of Milne Bay Province in 1923–1926. When this initiative failed, it was concluded that rice growing was too labour intensive and the environmental conditions were unsuitable. Cassava was then promoted and successfully adopted in the Cape Vogel area. In New Guinea, rice growing was promoted at Talasea in West New Britain and in East New Britain. On the Gazelle Peninsula, enough rice was produced for a steam-driven mill to be imported. Rice was grown on Siassi Island in Morobe Province until 1941. During World War II, Japanese troops grew rice on the Gazelle Peninsula in East New Britain, and on New Ireland, but appear to have concluded that sweet potato was a more productive and reliable crop. For example, in Sandaun and East Sepik provinces (then one province), Japanese troops grew sweet potato and Chinese taro, rather than rice, in an attempt to feed themselves after they were cut off from Japan. In Papua, the Australian military administration made rice growing compulsory at Bereina and introduced a mechanical harvester. After the war, in 1947, the New Guinea Nutrition Survey Expedition studied village food production in five locations and concluded that the ‘wider cultivation of crops such as peanuts and rice, which can be easily stored and transported, would help eliminate regional and seasonal food shortages’. W.L. Conroy, who was the agricultural officer on this survey, later became the Director of Agriculture in PNG. He was so convinced that rice could be produced satisfactorily at Bereina that he resigned his post as director to personally supervise the Bereina project. At Bereina, machinery was introduced and tractors were used to cultivate relatively large areas. In the Sepik provinces, in particular around Maprik and Nuku, villagers began growing rice within the traditional shifting cultivation system in the 1950s as part of an indigenous rural development movement led by Pita Simogun at Dagua. Simogun had visited Australia during the war and observed Australian farmer rice-growing cooperatives in the Riverina. Similar movements occurred in the Markham Valley and in Oro Province. Some of the villagers involved in these movements brought cargo cult elements into the growing of rice. The colonial agricultural extension service attempted to respond to this movement with the introduction of Rural Progress Societies, hand-powered hullers and subsidised purchases. During this period, village rice production was also promoted by government extension services in Morobe (at Finschhafen), Milne Bay, New Britain, Bougainville, Gulf and Central (at Bereina and Kupiano) provinces. Domestic rice production in PNG has fluctuated from year to year but has been less than 1500 tonnes per year since 1975 (Figure 2.5.1). Most production has been unirrigated. Rice has continued to be grown spasmodically at Bereina in Central Province, as various aid and agricultural investment projects have attempted to make production there sustainable. In the late 1970s the East Sepik Rural Development Project, funded by the Asian Development Bank, made a large commitment to upgrading rice growing and increasing production to 4000 tonnes. However, production in East Sepik Province had almost ceased by 1987. Small irrigated rice projects have been undertaken near Rabaul using Japanese aid; at Gabmazung near Nadzab in the Markham Valley by the Lutheran Mission; at Bubia with Taiwanese aid; at Cleanwater Creek in the Markham Valley by Trukai Rice; at Erap Research Station, also in the Markham Valley, by DAL; and at Bau near Madang by a Philippines non-government organisation. Rice was grown in Bougainville Province during the civil war (early to mid 1990s), but by 2002 rice growing there had virtually stopped. From about 2000, production increased in some locations, including in parts of Central, Oro, Morobe, Madang, East Sepik, Eastern Highlands and Simbu provinces. This was in response to the rapid rise in the price of imported rice (Figure 4.3.3). The peak of the recent expansion in rice planting was in about 2001–2003, but production appears to have declined since then. For example, rice production in Madang Province was about 80 tonnes in 2003, 60 tonnes in 2004 and 40 tonnes in 2005. There was little rice being grown in the highlands by 2005. The Trukai Rice depot at Erap in the Markham Valley was able to purchase only 4 tonnes of locally grown rice in 2004 and 7 tonnes in 2005. Thus locally grown rice remains a minor supplement to the traditional diet in a limited number of locations. At the national level, domestic rice production is still only a small proportion of rice imports and the level of production is a tiny fraction of that of the root crops, sago and banana (see Section 2.2). Contrary to assertions that Australia discouraged PNG rice growing, more agronomic field trials have been carried out on rice than on any other crop (Table 2.5.1). Furthermore, many of these trials were done before Independence in 1975. Of the total number of agronomic field trials conducted between 1928 and 1978, 19% were on rice, compared to 11% on sweet potato, the most important food crop for about two-thirds of rural Papua New Guineans. A significant amount of research has also been conducted on rice since 1978. A great deal of evidence exists that the colonial administrations of Papua and New Guinea made strenuous efforts to grow rice in PNG in order to offset the costs of imported rice. Given the continued enthusiasm by political leaders and administrators to replace imported rice with domestically produced rice, it is important to understand why rice production has not yet become a sustainable rural industry in PNG. At least seven detailed investigations on aspects of growing rice in PNG have been undertaken since 1950, a number sponsored by non-Australian-based agencies. A summary of their findings suggests there are three main interrelated reasons why rice has not become a sustainable industry in PNG: these are to do with the environment, with cost efficiencies, and with returns to labour. Upland rice has been grown in many parts of PNG, but yields are generally low at around 1000–1500 kg/ha. Rainfall is too unreliable in some locations in PNG for perennial, unirrigated rice growing. The variation in rainfall from year to year, within the year and in the regularity of the beginning of the wet season is not reliable enough to grow large areas of unirrigated rice (see Section 1.5). This is a major reason why, for example, rice growing has failed to become sustainable at Bereina in Central Province. Where irrigated rice has been grown, pests, weeds and disease have severely reduced yields. Pests and diseases are not a major problem where fields are shifted every year. Soils in many areas have poor water-holding capacity and are thus unsuitable for irrigated rice. The high capital costs of establishing irrigated paddy fields and high production costs per tonne are a severe constraint to the development of a PNG rice industry. The main rice-producing countries of the world have comparatively lower production costs. A number of studies show that the costs of establishing large enough areas of irrigated rice to replace imports would severely distort the PNG economy, would require large subsidies and would result in a substantial increase in the retail cost of rice within PNG. Trukai Industries Limited, the main importer of rice into PNG from Australia, has been growing irrigated rice experimentally in the Markham Valley since 1998, but has been unable to achieve economic yields because of pests, weeds and soil problems. Until recently, imported rice has been a relatively cheap food. For example, up to 1999 rice gave better value for money than purchased sweet potato, banana or Irish potato in Lae. This position changed with the decline in value of the kina, but taking into account the ease of transporting and cooking rice, it remains a competitive food for urban people in PNG. The most important reason that rice cultivation has not become significant in PNG is related to returns on people’s labour. Returns to labour are higher in the production of root crops than in rice, both in terms of yield and food energy produced per hour worked (see Section 5.20). Returns from growing coffee or cocoa are also higher than for growing rice in cash income per hour worked. Therefore, after experimenting with growing rice, many villagers decide they are better off growing root crops and export cash crops such as coffee or cocoa. The one place where rice growing has become ‘traditional’ is in the mountains inland of Finschhafen in Morobe Province, where access is difficult, imported rice is expensive and coffee is costly to market. Compared with other crops, the cash returns to labour from growing rice for sale are significantly less than for cocoa, oil palm, vanilla, Robusta coffee and sweet potato. Many PNG villagers believe the returns to copra and rubber are too low to make harvesting and selling them worthwhile, so it is not surprising they do not participate in rice growing. Another reason that rice production has not expanded in PNG is that it does not fit easily with village culture. This is because when a rice crop is ready for harvest, there is a relatively short period when harvest must occur. Unlike the export tree crops or root crops, delays in harvest can result in significant yield loss. Such delays are not uncommon in village communities because of other demands on villagers’ time. Over the last 20 years a number of economists have concluded that PNG is better off to import cheap rice and to export high quality palm oil, coffee and cocoa, than to try to establish a domestic, import-replacement, rice industry. On the basis of these economic analyses, it is unlikely that international aid agencies will provide funds to PNG to establish a rice industry. That does not mean village smallholders should be discouraged from growing rice. But it does mean that import-replacement production levels are unlikely in the foreseeable future.